If the operating current of the overall series string approaches the short-circuit current of the “bad” cell, the overall current becomes limited by the bad cell. The extra current produced by the good cells then forward biases the good solar cells. If the series string is short-circuited, then the forward bias across all of these cells reverse biases the shaded cell. 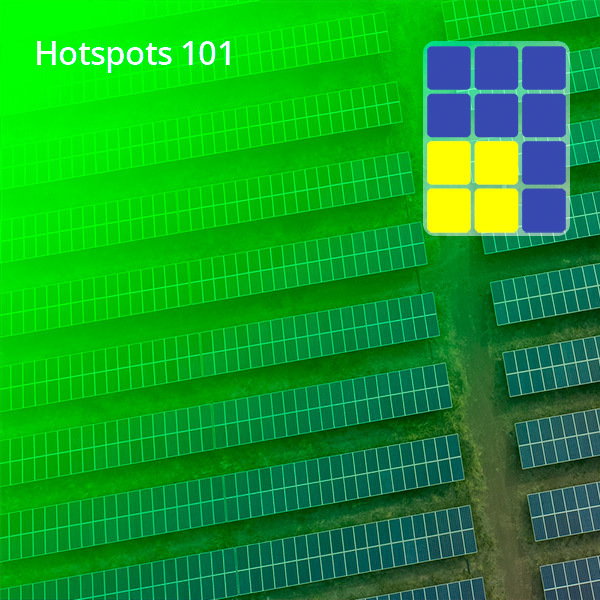 Hot-spot heating occurs when a large number of series connected cells cause a large reverse bias across the shaded cell, leading to large dissipation of power in the poor cell. Essentially the entire generating capacity of all the good cells is dissipated in the poor cell. The enormous power dissipation occurring in a small area results in local overheating, or “hot-spots”, which in turn leads to destructive permanent damages, such as cell or glass cracking, melting of solder or degradation of the solar cell. In simpler terms, during shading, PV cells start experiencing a pronounced temperature rise and a subsequent reduction in the power being produced. At times, the reverse bias voltage can breach the threshold of the breakdown volatge within a couple of seconds, resulting in an open circuit in the serial branch to which the shaded cell is attached. In case the module to which the defected cell is connected is in series then on being left untreated, the open circuit caused by the cell will consequently disconnect the whole system containing the damaged module. This will induce a massive fall in the energy being produced by the entire system. A way of tackling shading is bypass diodes. When connected in antiparallel with the PV cells, these bypass diodes restrict the reverse voltage effect, thereby, warding off the threat of the cell reaching its breakdown voltage. Unfortunately, in spite of these bypass diodes, hotspots still arise in the system. The silicon making up the cells, at times, has defects and impurities that result in a huge reverse current even if the cell hasn’t reached the breakdown voltage.